Mirror photo by Gary M. Baranec Chestnut Ridge’s Jacob Mowry catches a pass in the end zone against Berlin Brothersvalley Friday. 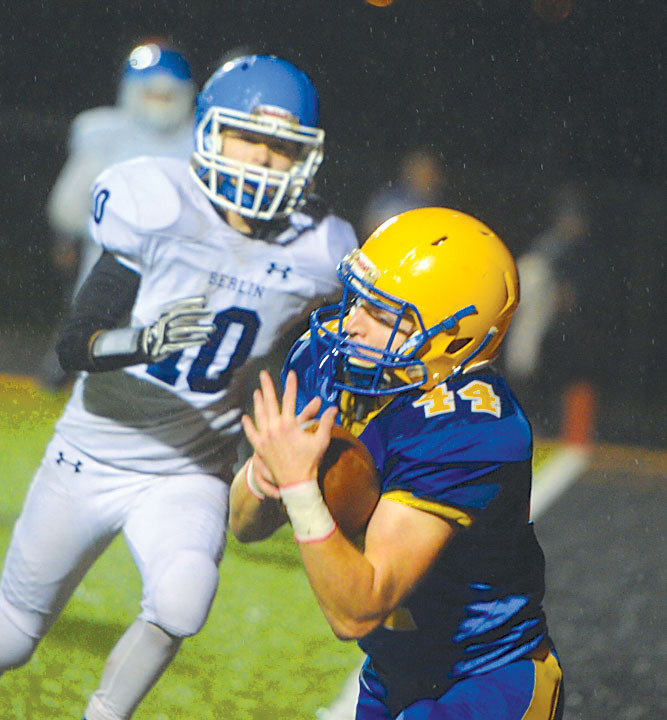 SOMERSET — Chestnut Ridge entered the District 5 Class 2A playoffs on a two-game losing streak, and Lions coach Max Shoemaker wasn’t quite sure what to expect when his team took on Berlin Brothersvalley in a semifinal game Friday. Fortunately for the veteran coach, his read was way off. The Lions scored 21 first-quarter points and got a pair of interceptions, one returned for a score, from Jared McGill in a 49-7 rout. Quarterback Logan Pfister ran for a game-high 103 yards and two touchdowns on just seven carries and added a pair of scores through the air. Pfister is in his first year under center for Chestnut Ridge but made it through the rigors of the Laurel Highlands Athletic Conference schedule and passed most of his tests with flying colors on the way to leading the Lions to an 8-2 mark in the regular season. McGill added a rushing score to go along with his interception return, and Jacob Mowry caught a touchdown pass and also picked off a pass. Matt Whysong caught a 25-yard touchdown pass and then relieved Pfister at quarterback midway through the third quarter. He did his best impression of the starter by dashing 35 yards for a score on just his second carry. Though the offense put up more than 40 points, Shoemaker pointed to McGill’s early interceptions as they key that really broke the game open. The Mountaineers (4-7) didn’t get much of anything started against the Chestnut Ridge defense. Berlin converted just three first downs, and most of its 111 yards of total offense came on Cole Blubaugh’s 60-yard run in the second quarter. Two Mountaineers quarterbacks combined to complete more passes to Chestnut Ridge (three) than their own team (two). Blubaugh added a 90-yard kickoff return for a touchdown just before the start of the fourth quarter to allow Berlin to avoid a shutout. Shoemaker’s Lions will play the winner of tonight’s Meyersdale at Everett game in the District 5 2A championship next Friday at a neutral site. Getting back on the winning track after close losses to Bishop Guilfoyle and Richland to close out the season and setting the tone early was important to Shoemaker, who added that winning the district title is an annual goal for his squad. RUSHING–Berlin Brothersvalley, Blubaugh 11-79, Sager 5-13, Etris 1-5, Paul 6-1, Countryman 3-0. Chestnut Ridge, Pfister 7-103, Weyandt 5-57, Whysong 2-35, McGill 9-28, Bollman 5-13, Harbaugh 3-9, Holderbaum 1-6, Hillegass 1-5, TEAM 1-(-1). PASSING–Berlin Brothersvalley, Countryman 1-8-2-9, Paul 1-2-1-4. Chestnut Ridge, Pfister 13-16-0-163, Whysong 0-2-0-0, TEAM 0-1-0-0. RECEIVING–Berlin Brothersvalley, Blubaugh 2-13. Chestnut Ridge, Weaver 3-39, Crocker 3-44, Mowry 3-17, Holderbaum 1-29, Whysong 1-25, Harbaugh 1-6, McGill 1-3.